England, a few years after King Arthur’s death. Dragons, ogres and knights roam the land. There is a sort of peace after a fierce civil war—the opposing sides, the Britons and Saxons, coexist. But a mist lies over the land, a mist that clouds people’s minds, taking away their memories. The mist keeps the peace—if brutalities are forgotten, then there is no anger or vengeance. The mist is the breath of Querig, the she-dragon. And although she doesn’t make an appearance until almost the end of the book, her very existence drives the characters. The book starts slowly. Beatrice and Axl, an old Briton couple, live in a warren-like communal structure and aren’t treated too well by their neighbours. They plan to visit their son in a nearby village, although neither can remember him clearly nor why he left. They meet a boatman who tells them he ferries couples across the river but can only take them both if they can prove their love for each other by remembering shared moments. But memories are fading, so most couples fail the test. Beatrice cannot face the thought of being separated from Axl, so she insists that they interrupt their journey to find what is causing the mist and destroy it so they can get their memories back. Beatrice and Axl travel with Edwin, a Saxon boy who has been bitten by a dragon and a Saxon warrior, Wistan, whose quest is to slay the dragon, even at the risk of reigniting the civil war. On their way they meet Sir Gawain, a knight of King Arthur’s, now old with an old horse and a rusty armour, which he insists on wearing although it’s more of a hindrance than protection. Together, the five of them head up the mountain towards the dragon. The book took me a while to get into. It starts slowly, and Beatrice and Axl constantly address each other as princess and husband. I found this annoying because no one talks like that. But the pace does pick up, and the writing reflects the couple’s slow, steady rhythm. And as for the unreliable narrator—a constant in Ishiguro’s books—the third-person narrative itself is unreliable. Nothing is entirely clear. The past is glimpsed in fragments through the mist, or like something you can see out of the corner of your eye but is gone when you turn. Ishiguro’s unreliable narrators emphasize the subjective nature of truth. But The Buried Giant does more than that—it raises fundamental questions about truth and memory. If losing your memory is the price of peace, is it worth paying? Take Beatrice and Axl, for example. They want to remember their past together but are afraid of the memories the clearing of the mist will bring. Like all couples who have been together for a long time, their shared past is full of love but also of hurt. Will they be able to survive the truth? And what will happen in the country once people start to remember the war? Should atrocities be forgotten so people can get on with their lives, or is the forgetting a travesty of justice? 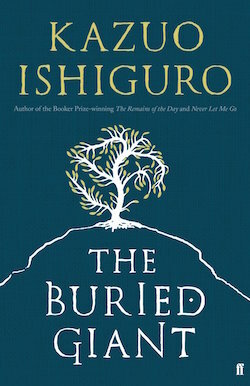 Ishiguro’s writing is, as always, a pleasure to read.He starts by describing England as it was then, no “winding meadows or tranquil meadows”, but “desolate, uncultivated land; …rough-hewn paths over craggy hills or bleak moorland. … Icy fogs hung over rivers and marshes, serving all too well the ogres that were then still native to this land.” With just one stroke, he transports the reader from known history into a fantastical, but still recognizable, world. It’s a slow burner of a book, and one I’d like to go back to.